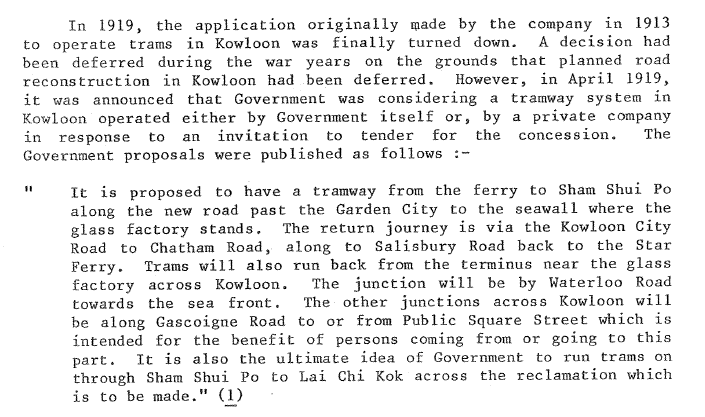 IDJ has sent the PF Leeds 1984 extract below concerning Trams in Kowloon. And as stated “the ferry” is the Star Ferry in TST. As the author says given the the HK Government’s policy of non-involvement in public transport and utilities (except the KCR and water supplies) it would interesting to learn why it was considered in this case. A tram bridge across the harbour! What were the complications of building tram lines in Kowloon? You would think Nathan Road in the 1920s would have been rather easy. The image accompanying this article does not show a tram trundling along Kowloon City Road in the 1950s. This article was first posted on 15th September 2014. Our Index contains a number of articles about Trams and also The Peak Tram in Hong Kong. The restriction on Kowloon tramway in the future might be the inadequate of land for tracks layout and terminus. Also the unique operation of trams (driving at one end) – it will be worsen if one tram broke down and drivers have to reverse at the crossover manually. By the 1920s, US and English experience had shown the decline of trams and streetcars versus the rise of automobile. Many privately run tram companies in American cities were losing ridership. Perhaps, that was a business consideration.